Encyclopedia Horrifica: The Terrifying TRUTH! About Vampires, Ghosts, Monsters, and More by Joshua Gee. Grades 6-8. I don't know about your library, but at my library there always seems to be a great interest in the supernatural, the horrifying, and the gross. You only need to look at the cover to know that our middle schoolers are going to love this book. Did you know that (on average, worldwide) 106 people die every minute? Did you know that the CIA once ran a program called Star Gate that recruited and experimented with psychic spies? 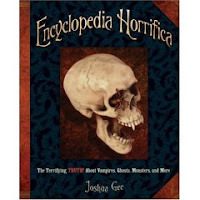 Learn all this stuff and way more when you peruse the glossy pages of Encyclopedia Horrifica. You'll accompany the author as he attends a ghost hunting session with two expert ghost busters at a 206-year-old house. See if you can tell the difference between "real" photos of ghosts and hoaxes. Test yourself for ESP. Learn 8 things you need to know about zombies. In picture-filled pages, this book examines the truth (and legends) behind many kinds of supernatural beings and events. Vampires, werewolves, sea monsters, haunted houses, and many, many more. Each article reads like a magazine and the text is mostly in small chunks and accompanied by photos and illustrations. It's obviously been well-researched and finding out the facts behind the legends and the legends behind the monsters will fascinate young readers. This is a surefire hit with horror fans and will appeal to reluctant readers. A selected bibliography is included at the end (with the full bibliography available on the author's website) along with an index and picture credits. I have added this to my list to purchase. I have some students this year who think that Shan's Lord Loss and Paul Zindel's Reef of Death are "not gory enough". They won't read anything but horror. I may need two copies. Thanks!